It’s been almost a year. It’s been a long time. A lot has happened. 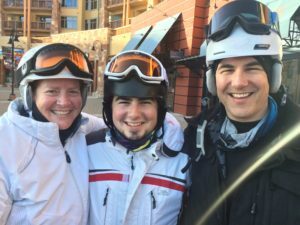 After my daughter passed in Jan 2015, I shut down. All three facets of my life were shattered: my family, my happiness, and my work. For my family, I put in countless hours keeping it alive. For my happiness, the only thing to do was allow time to pass. For my work, well, that was a different story. See, I worked for a military contractor. Yes, it’s true that I built training games for them. Twelve years of graphics, visualizations, and training games. It’s also true that while working there, I was involved in discussions, proposals, and projects that focused on the military. Aka fighting. Aka war. Aka death. And I’d had enough of death. So, as a family, we made a promise – wait 12 months, let the raw emotions heal a little, and then decide about our future. It was impossibly hard. One day at a time, until a week would pass, and eventually, it would be another month. Struggles, depression, and also sometimes, small bits of happiness. Finally, it was Jan 2016. And in truth, I had done a bit of healing. I had begun to re-define what it meant to be husband and father. 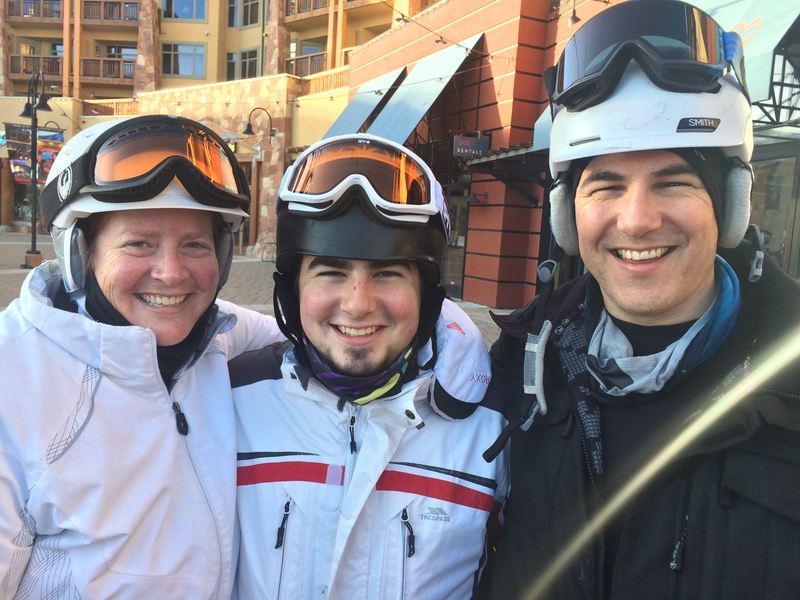 I had begun exercising, planning trips, and even podcasting – all of which helped to bring back some happiness. And yet, then there was work. Work did not make me happy. Even after 12 months, walking into work felt like a betrayal of the gifts of gratitude that my Make-A-Wish daughter gifted me. So we made our decision. Which led to another problem. Turns out, Virginia is not a hotbed for gaming. In fact, when I searched LinkedIn for game development jobs in Virginia, the number of results was a big, fat, goose-egg – aka zero! Our only choice was to move far, far away – leaving behind everything we had built for 40+ years! Our home, friends, and connections in the community would be gone. In the U.S., there’s only a handful of hot-spots for game development. Places like Seattle, Raleigh/Durham, Austin, San Francisco, and of course, the LA area. So, we pulled out the maps, began visualizing our future, and looked for a fit. That’s when I came across something surprising. Do you know what the 2nd most played mobile game in the world is? I didn’t. Sure, I could have guessed that Candy Crush was number one. Second though? Hmmm… Well, it turns out that the #2 mobile game in the world is Solitaire! Which is both surprising and also, maybe makes a little sense. After all, solitaire is casual, ever-green, and time honored. A game spanning generations. And the company that makes the most popular solitaire was in Irvine, California – which happens to be one of the best places to live in the country! So, I sharpened up my resume, recorded some interview videos, and went for it. The details of getting the job are a topic for another day. Suffice to say that I interviewed, landed the job, and moved out to Irvine, to take a job as Technical Director for the Solitaire suite at MobilityWare in April 2016. And once I started the process, time began moving really, really fast. I stayed in a bunch of AirBnB’s, got my family moved out here, and went all-in at work. Time flew! And now, somehow, it’s already Feb, 2017. I love my job, my family is together, and I’m relearning what it means to find happiness in a world without my daughter. I am telling this story for all of you who have been so patient. “Where’s Gigi?”, “When’s the next episode?” and even, “How come these apps are still broken?” Losing my daughter, rebuilding my life, and transitioning to this new job has taken all of my energy. And it still does, even now. The good news is that I’m fully engaged with my life – I’m living. I can’t say what the future holds for podcasting, Gigi games, and Indy development. I can only say that life is short. My daughter taught me to be grateful, no matter what. And that’s what I’m doing, each day, on my way home from work. Instead of a gratitude bridge, I now have a gratitude stop-light. Because my commute is only 8 minutes. I’m grateful for my job, my son, and my wife. And I’m still trying, improving, and repeating. So he asked, “Are you still a fan of the Purple Cow?” Game dev students were asking the same question, from Virginia to Detroit. It’s a simple question, without a simple answer. This episode gets zen on Purple Cows, via three of my heroes: Will Wright, Jonathan Blow, and Ira Glass. Years ago, my boss asked, “How do you get all that stuff done?” Then, last week, my friend asked a similar question. And I realized, I didn’t have an answer. So I thought about it – podcasts, an indie business, and a family, on top of a full-time job. This episode is the answer – three tips for getting things done. I broke my own rule! A few weeks ago, I shared a project I was working on, before it was really ready. And after that, I kept putting off creating the video that I needed to get my project on Steam. Week after week, I did nothing, because I was afraid. This episode is about overcoming fear. I was stumped. The educators in the room were all staring up at me, waiting for me to finish my sentence. Unfortunately, my mind had blanked. I could not recall the ingredients of Flow. In that moment, it didn’t matter that I had taught game design dozens of times, to hundreds of learners all across the country. All that mattered was that flow was just a list of four ingredients – raw text. With neither an acronym, nor a visual aid to guide me, I could not bring them to mind. That moment began my quest. 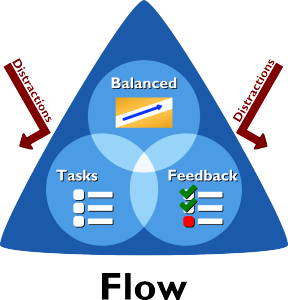 I needed a better way to think about Flow. So, I spent more than two years researching, tinkering, and getting feedback on some new ideas. And finally, today, I am ready. I’m presenting the answer to my quest in a new paper for Modsim World Conference 2016. 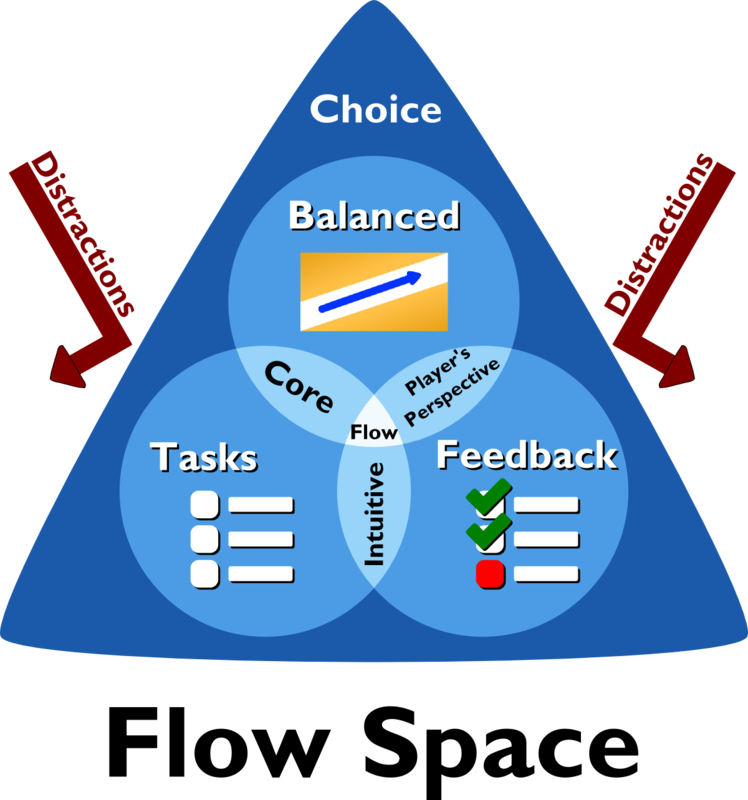 The full paper is here: Flow Space – A Visual Guide for Flow and Simplicity in Games. It’s not a particularly long paper, coming in under 9 pages. And even so, if you’re like me, you’d still prefer to see a cliff-notes version. So, here’s the basics. What’s less cool is that this recipe is not very easy to remember. Even after a decade of using the recipe, I still got to a point in a conversation where I couldn’t pull up the four ingredients. And maybe, it wasn’t my fault. That’s what I came up with. Well, to be honest, it wasn’t the first idea I came up with. Though I’m happy with, it now. Especially considering the great feedback I’ve gotten from game development students, educators, and fellow designers. I love how this simple picture helps people focus on just one thing – they recall the image with the three circles and the triangle, and then, they can generally fill in the rest. I found the answer to my quest! 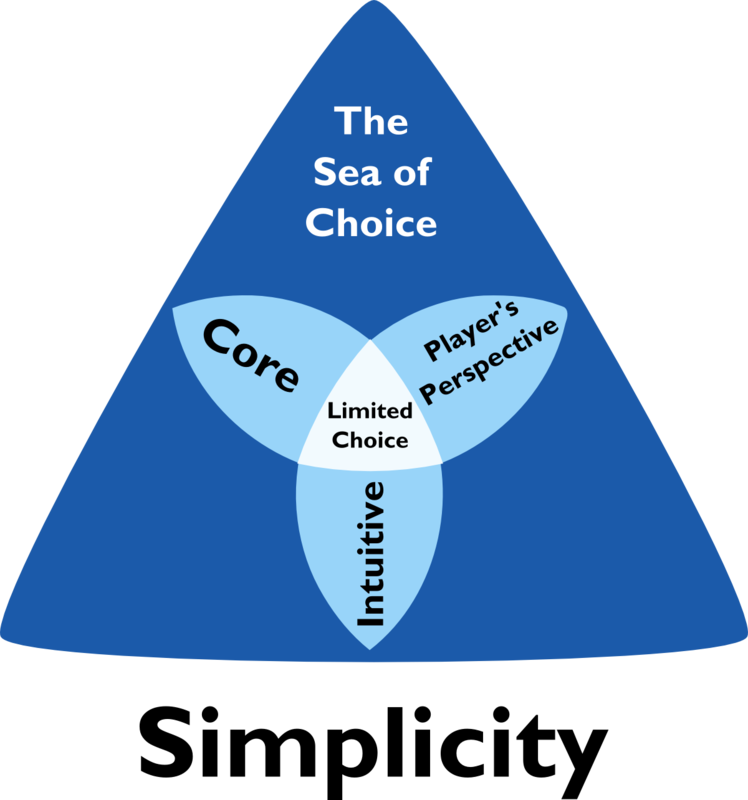 And even so, I was already in this crazy frame of mind where I was thinking about diagrams, recipes, and tenets of game design. 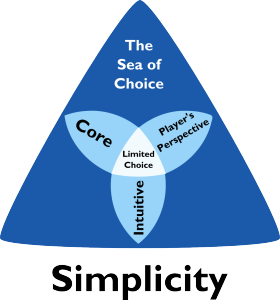 So, I turned my attention to one of my favorite topics – Simplicity. Now simplicity is a funny word. It’s kind of vague, and also, kind of powerful. Which is probably why Leonardo da Vinci said, “Simplicity is the ultimate sophistication.” Which is pretty heavy stuff. And what kind of stinks about simplicity is that there really isn’t a practical definition for what simplicity means in games. I mean, sure, “I know it when I see it”, except that’s not very useful. Fortunately, as I said, simplicity is one of my favorite topics. It’s something I’ve been researching for almost 5 years. And, after failing to find a recipe that already existed, I decided to create my own. So, here’s my recipe. Even if it’s not a perfect recipe, at least it’s a place to start the conversation. And, in the spirit of simplicity, the ingredients spell an acronym, CLIP. Which helps remind me to clip things that don’t fit. Cute – right? Now CLIP only takes a single slot, so I rarely have trouble remembering the ingredients, no matter how involved I am in what I’m doing. Even so, I wanted to put simplicity in a diagram too. And even more important, I wanted the pictures of simplicity and flow to be as related as the concepts themselves are. And then, finally, on a long-drive back from Pennsylvania, I came up with this. Sure, it’s not quite as cool as the Flow picture, and even so, there’s something about it that kind of works. 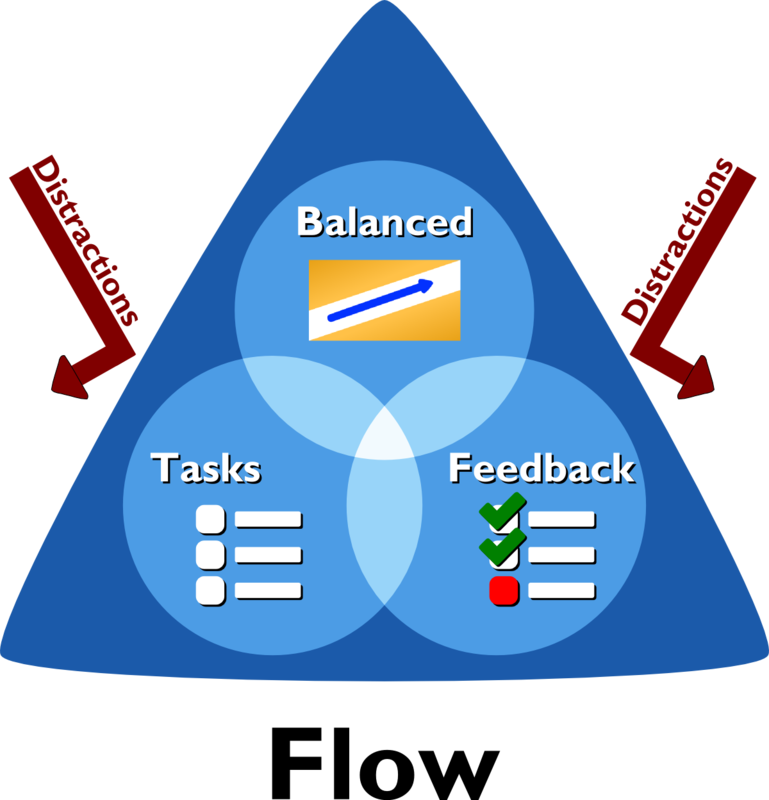 I particularly like how similar it is to the Flow diagram – the shapes, style, and colors. And, because they are so similar, I could now combine the two diagrams into one picture, like this. Tada! 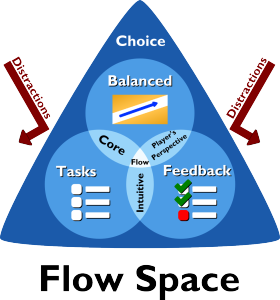 I call it Flow Space – a Visual Guide for Flow and Simplicity in Games. And, that’s the cliff notes. If you want the details, or just have 20 minutes to kill, then you might enjoy the full paper too.